Thermoplastic yellow/white line marking paint - Supplied in rolls to be applied with the addition of a source of heat to bond to the platform typically to denote the safe zone in which to stand on approach of a train. Composite manhole covers - We hold a range of non-conductive, composite manhole covers in stock for use on platforms to negate the effects of flux. Linear drainage - Huge stocks of linear drainage inclusive of composite gratings for non–conductive surface water removal. Hollowcore flooring - Pre-stressed Concrete slabs used for platform extensions. This systems provides benefits of Long spans and single lift installation. Block and beam flooring - Simple and fast installation of suspended floor applications such as platform extensions. This system provides a solid base to work from and can be designed and fabricated around quickly. 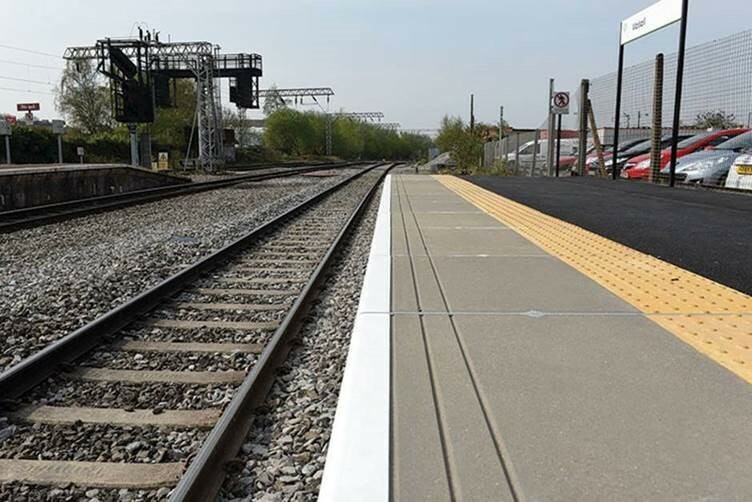 Coping stones - Used as nosing stones for the front edge of rail platforms. We stock a full range of FP McCann, Network Rail and LUL coping stones, all standard sizes are readily available. Dual coping stones - A combination of Coping Stone and Tactile in one unit. This reduces the installation time as only one product needs to be moved and installed. Different colour tactiles and different finishes for the copings are available. Oversail blocks - Used to support and compensate for the overhang of coping stones on the edge of a platform. Readily available from stock. Offset tactiles - Used directly behind the coping stones to aid the visually impaired safely navigate the platform. Corduroy tactiles - Used to denote the beginning of staircases and other hazards. Visual adhesive tactiles - Network Rail and LUL versions available in the full range of colours along with adhesive and fillet. Supplied in boxes of x10 tactiles. A fast and simple way of installing tactile paving. Access chamber boxes - Stackable, plastic Inspection chamber boxes for electrical ducts to be viewed and maintained are available in a range of sizes from stock.